The Restoration Group offer a complete service to restore and enhance uPVC of your conservatory, windows and doors. Our simple and dynamic uPVC spray painting conservatory solution, allows you to choose from a wide range of colours to match your existing décor or completely change the appearance of your conservatory, and we can guarantee that the process can provide protection for many years to come. One of the most common questions we get asked is just how the process works? We can begin our uPVC conservatory spraying process by first preparing the area, ensuring any of your belongings are safely removed from the spraying area. We will then completely clean your uPVC conservatory features, first using Vinyl-Kleen a specialised uPVC cleaning detergent and then applying a solvent based solution to remove any grease and grime which would prevent the paint from adhering to the conservatory surface. From here our expert team will apply a light abrasion to your conservatories uPVC surface to ensure the uPVC paint solution adheres fully, before masking taping up and covering the glass to protect it from the paint. Finally, our team will spray paint your uPVC conservatory in your chosen colour, applying a minimum of three coats depending on your chosen colour. The paint will be touch dry within 30 minutes, we’ll conduct a final check before making sure your home is returned completely to the state it was before we arrived minus your new uPVC spray painted conservatory. 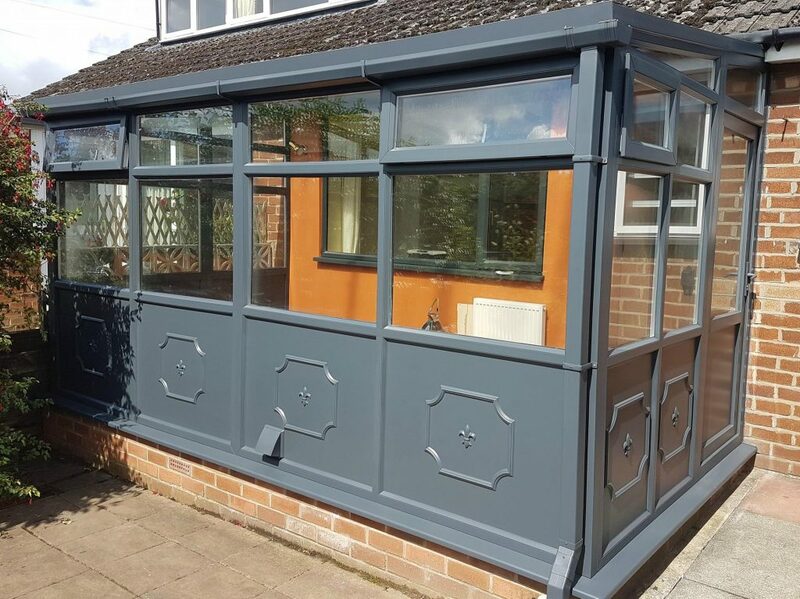 If you’d like to find out what some of the benefits of uPVC conservatory spray painting then take a look at our blog: 4 Benefits of uPVC Spray Painting for your Conservatory. If you’re looking to restore your property, look no further than The Restoration Group! We offer a complete service that can enhance the quality of your conservatory doors and windows, so be sure to check out our uPVC conservatory restoration here! The team of professionals at The Restoration Group are the experts when it comes to enhancing your windows and doors! We make sure that your conservatory fits in perfectly with the surroundings, creating a more contemporary look and feel. When it comes to restoring your uPVC conservatory, you can count on us to provide you with a service that is quick and easy, providing you with as little disruption as possible. The time it takes to update your conservatory by spraying it is significantly less than the time required to install new conservatory windows and doors! By painting and restoring your uPVC conservatory, you can ultimately prolong the lifespan of your windows and doors. It’s also guaranteed to last up to 10 years longer. With a wealth of knowledge and expertise, we can transform your conservatory into something more up-to-date, tailoring it to suit your requirements more specifically. The transformation of your uPVC conservatory is perfect for adding personalisation to your property, regardless of whether it’s your home or your business! Find out more here today!